School kitchens in Scotland have been ordered to improve food hygiene standards 83 times in the past five years, it has emerged. The Food Standards Agency (FSA) issued the notices after inspecting schools, nurseries and after-school clubs. The Scottish Conservatives, who collated the FSA figures, called for better standards. 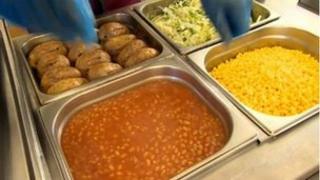 The Scottish government said councils were ultimately responsible for hygiene standards in school kitchens. Conservative education spokeswoman Mary Scanlon said it was "simply shocking" that thousands of children across Scotland had been served food from kitchens that failed standard hygiene laws. "Parents will be horrified to know their child may have been served a meal from a facility that inspectors saw fit to serve with an improvement notice," she said. "Basic levels of cleanliness should be adhered to across the board and any failure to meet such standards should be addressed as a matter of urgency." Ms Scanlon added: "One kitchen failing to make the grade is one too many and those in charge of our children should be striving to ensure that all the food given to our children is served from premises that meet the highest possible standards." The agency's "improvement required" notices are given if inspectors think premises have failed to live up to the terms of the food hygiene information scheme, run in partnership with local authorities. The number of notices increased from four in 2009 to 28 in 2012. There were 23 notices last year. Facilities in Glasgow, Highlands and the Scottish Borders were among the worst offenders for cleanliness in their catering facilities, according to the Conservatives. A Scottish government spokesman said: "Local authorities are ultimately responsible for standards of hygiene in school kitchens, which should be of the upmost importance, and school premises should be also inspected by councils' own environmental health services. "The food hygiene information scheme applies to all food outlets that supply food to consumers in the authorities taking part in the scheme and the scheme is currently running in 30 Scottish local authorities. "All food businesses whether private or local authority owned must comply with the current food hygiene regulations. "Local authorities are responsible for food law enforcement in this type of establishment and have powers to close down establishments that pose an imminent risk to public health." Douglas Chapman, education spokesman at council umbrella organisation Cosla, said local authorities took their responsibilities "very seriously in terms of the nutritional value and quality of food served in schools and in its safe preparation". He added: "On a daily basis school kitchens must be one of the most significant producers of meals in the country and our staff work to the highest professional standards. "Any recommendations for improvement are taken very seriously as we have a strong ethos relating to our duty of care to every child."